Of course, this is where the opening night took place, showing AI WEIWEI: NEVER SORRY by first-time feature filmmaker Alison Klayman. An extraordinary and chilling story of a fearless Chinese artist turned activist, including his 80-day disappearance last spring. A smart, compelling portrait of a complex, fascinating man. She followed him from 2009 to 2011, capturing his private life as well as his artistic process, and his defiance of authority leavened by his mischievous wit. She also uses his own short films documenting political and authoritarian corruption in China today. Naturally, Ai makes an enemy of the Chinese government in the process. The film captures an escalating series of incidents including plainclothes surveillance, physical assault that lands Ai in hospital for emergency cranial surgery, and finally his detention. To this day, he won’t talk about it – but his silence speaks louder than words and makes us understand that he has shifted into a different form of resistance. The film is lovely, with all the naivety and freshness of a young filmmaker having been thrown a bone too big to chew, and therefore retreating into collecting every waking moment with Ai. What was amazing to discover was his understanding and reliance on blogging and tweetering, bypassing the national firewall, bringing light into dark situations, and poking fun at a system that has no sense of humour. The choice of this film, which is rich in content but does not have the wow factor of other films in the programme, denotes Hotdocs commitment to social issues. 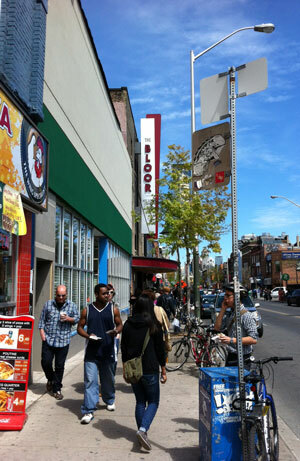 Talking to the Bloor's programmer Robin Smith later on, I was wondering what kind of audience they expect on a nightly basis (off festival time). He said they had been monitoring attendance, getting an average of 53 – enough to break even. And it seems that 60 percent of them are not festival-goers. Over the next months, it will be interesting to see what kind of documentaries get programmed, and how they manage to increase their audience. I find this venture extremely inspiring and exciting – happening at a time when broadcasters cut or reduce documentary slots. If only we could do this in Edinburgh… Scottish Documentary Institute would love to have its own cinema! And if documentary filmmakers only had one such cinema in every major city, surely that would make international distribution much more viable? 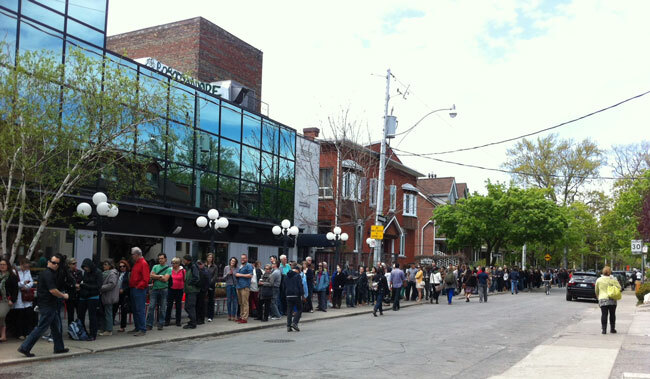 From the Bloor cinema, the queue for documentaries goes around the block.